The turnout was good and the weather even better for the dedication of the Norma Ellis Cutler pavilion on Baker Prairie on April 21st. Here are some of the photos from the event! This entry was posted in Uncategorized on May 7, 2018 by searchforsimple. This entry was posted in Uncategorized on April 4, 2018 by searchforsimple. Below please read the invitation for the dedication of the Normal Ellis Cutler Pavilion on Baker Prairie. We are hoping to get a good turnout for this event so please consider attending! More News on the Baker Prairie Pavilion and Picnic Table Campaign! We are excited to share news about a pavilion for Baker Prairie! Through a grant from the Arkansas Game and Fish Commission, a 20-foot pavilion is being constructed this summer on the north side of the Harrison Middle School property on Goblin Drive. It will feature arched beams, a concrete floor, and a wide, curved, handicap accessible walk lead from the middle school parking lot. Our vision is that the pavilion will be a focal point for visitors to the prairie who may be unsure where to park or how to access its trails. We especially hope the building will be used by school groups to provide lesson plans and tours. In addition, we anticipate the pavilion might be reserved by groups for select events. Sponsorship of tables for $725 (we need 6) with a recognition name plate attached to the item. General sponsorships that will go towards tables, benches, signage or trash receptacles. There will be a plaque inside the pavilion listing all our sponsors: Bronze $100, Silver $250 or Gold $500. Pavilion sponsors at the Silver or Gold levels will also receive lifetime membership in the Friends of Baker Prairie. Annual membership dues that will be used for scholarships, bird sanctuary restoration, and other activities. You can join Friends of Baker Prairie or renew your membership. Our membership dues are in the spring but if you join or renew now, your membership will be active until spring of 2019. This collaboration between the community, the middle school and the Arkansas Game and Fish Commission will be a great asset to your community and we hope you can be involved! Please stay tuned for our gala dedication ceremony in the autumn. IN the meantime, donations can be made through our website https://thefriendsofbakerprairie.org or mailed directly to us. We will, of course, send you a tax deductible receipt. For more information, please feel free to write us at f_o_b_p@hotmail.com. This entry was posted in Uncategorized on August 11, 2017 by searchforsimple. In an event co-sponsored by the National Audubon Society and the Arkansas Natural Heritage Commission, 12-14 naturalists led by Joe Woolbright met on Baker Prairie last Saturday (August 5th) to collect seeds. 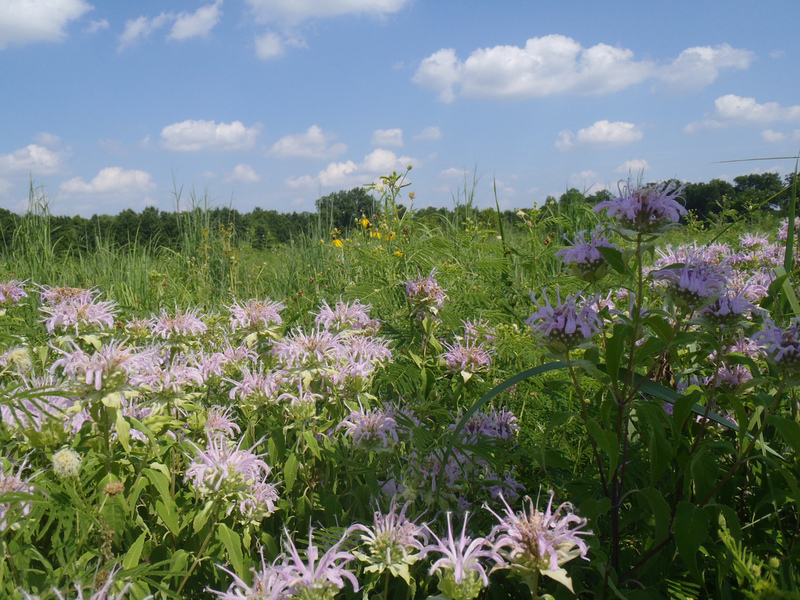 Four species of plants were targeted: Lavender Bee Balm (Monarda fisulosa), Pale Coneflower (Echinacea pallida), New Jersey Tea (Ceanothus americanus) and Yellow Wingstem (Verbesina helianthus). This project was to collect seeds in order to give them to farmers working on prairie restoration projects. Please remember that private collecting of seeds or removal of plants from the prairie is strictly forbidden in order to protect this important natural area! Check out the pictures below!